Creative IT is a specialist Acer laptop repair store based in Central London. 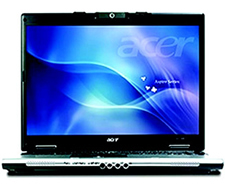 We offer quick Acer laptop screen repair and replacement services for both individual and corporate clients. Our experienced technicians can troubleshoot and fix laptop display problems affecting Acer Ferrari, Aspire, TravelMate and Extensa notebook models. The professional service engineers at Creative IT can carry out prompt Acer laptop screen repair and Acer laptop screen replacement services based on the nature of your screen fault. The most common laptop screen or display faults include cracked or broken LCD screen, no video issues, distorted or scrambled video, damage caused by liquid spillage, multiple images, black or blank screen, random characters on the screen, screen has colour problems, flickering of the screen, scratches on the LCD laptop screen, brightness and contrast problems, stretched or blurry images, LCD around edges is discoloured, font or screen is fuzzy, backlight (inverter) problems, splotched sections, some areas of the notebook screen appear darker, bright or dead pixels, black splotches cutting through the screen, diagonal or jagged lines, horizontal or vertical lines across the display, screens with faint images, display is dim during or after start up or boot, incorrect colours, resolution too low, black splotch with white sections, images are jumbled, blotches and white spots, red or green lines on the screen, lines or dark spots on the display and 1 long and 2 short beeps. Creative IT provides a three month back to base warranty on every Acer laptop screen repair service for Ferrari, Aspire, TravelMate and Extensa notebook models and for new Acer laptop LCD screens supplied and fitted. For more information about our quick London Acer laptop screen repair and Acer laptop screen replacement services in the UK or to confirm screen availability, please free to contact us at 020 7237 6805 or e-mail us at info@creativeit.tv.